Went to windandsea in San Diego last weekend to check out the surf and decided to start my fall with this great painting. Been a little while since I've been able to post. I've been working on remodeling my house and have had to move my studio setup. I figured I'd do a little something digital on my mac to keep the creative spirit content. Another great view in Laguna Beach, as if there were any other kind there. This is looking north from a point in Heisler Park. Can't wait to be there in just a few more weeks to paint some more. Abstract view of Laguna Beach capturing what I think are the colors I feel when I'm there. My exploration of the fantastic California coast moves north with this painting. When I lived outside of San Francisco I use to love driving up and down the coast. Every turn had a new unbelievable scene to view. I love the deserts of the southwest. So much so that I left cold New England as soon as I finished school and moved to Arizona. I did this painting from my memories of living in that great scenic area of the country. 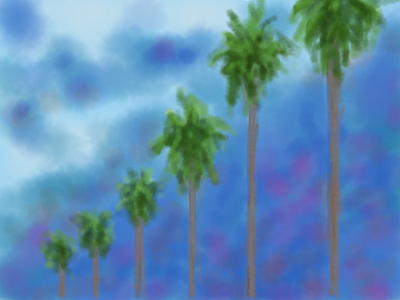 I don't think I'll ever get sick of painting palm trees. There's just something about them. Maybe they remind me of when I lived in southern California and all the good times I've had there. To see this painting being created check the video below. Would love to take a walk on this empty beach with my dog Sam. This is the Mission Beach pier in San Diego. Quick note about a new video painting series I'll be producing available on YouTube. Have a sneak peek HERE. Great view of your typical street in El Centro California. Don't know how many times I've driven through there or flown over El Centro but I always enjoy the view. Someone commented to me on this painting that "it doesn't look finished". Which, if you've ever been to El Centro, that about sums it up. I've been watching a number of shows lately that take place in the deserts of the southwest. I use to live in Phoenix and did a lot of traveling thought those deserts and I've always found the scenery and plants so interesting. Here's my small view of one of those interesting desert trees. This is actually a scene from an artist challenge. This was one of three scenes you could paint. When I started this, not a lot of other painters were choosing to paint this one. I saw it and thought I'd love to do it because of all the different elements, the water, the rocks, the light filtering through the trees in the background. Think this came out pretty nicely. Gives me a feeling of peace when I look at it. If you'd like this piece for your own collection, just click on the 'buy now' button at the right of the blog.